Internet of Things, in short IoT, is taking the use of technology to the next level. In this computed concept, various devices are so connected with the other devices, resulting in easy operation of things. With the help of IoT, one can operate various devices like automobiles, smart home, machinery, wearable’s, and many such through smartphones. Though, this IoT is revolutionizing the tech world, there is no limit for tech potential. It is strongly believed that there is a long a way to go to visual the full potential of the technology yet. This IoT, is one of the mile stone in the development of technology. IoT, offers one of the best solutions for security management, this is made possible by the insertion of connected sensors within device making it possible to track it. Statistically, the various IoT devices which are in current use are about 10 billion and it is expected to reach about 24 billion by 2020. Apart from IoT, which is offering the best security solutions, marketers are also embracing a technology called Blockchain. Blockchain Technology, using its decentralized system to secure a network. With the help of Blockchain, one can raise the security levels, provides privacy and will act in compliance with all the IoT connected devices. There are so many benefits with the latest trends in the tech world, at the same time, there are also so many challenges associated with it. But, the various tech experts are in the way to find the best possible solution for it. One of the best example for this above statement can be cited at the integration of Blockchain technology with the IoT. Blockchain technology uses decentralized system to secure the network resulting in an assured transaction. This Blockchain will offer the best security solution for the various enterprises by offering it an immediate security, also one can keep check to the creating chaos in various business processes. In these modern days, technology can be used in either of the ways, good or bad i.e., using the various latest trends in the market, one can use it for productivity things, or at the same time some people are misusing the technology. Miss usage of the technology may include things like hacking the data. With the help of Blockchain technology, one can protect the data from getting corrupted, also it can enhance the authentication and outbreak control. This is made possible with cross platform interoperability and maintenance of stable running of many connected devices on a number of platforms by generating machine to machine contract. Blockchain technology, with its best performance, was proven to be the best security solutions. With the help of these reliable technology, the users can perform the task with less efforts and it is cost effective. It is not exaggerating to say that the integration of Internet of Things and Blockchain technology made it the best choice for various leading enterprises. Perhaps, Chief’s Suite still need time for the complete understanding of the Blockchain technology potential and to find out all the various possible ways to integrate them into their business system. As the Internet of Things makes it possible to connect millions of devices to connect with each other and to have the exchange of data between them, the primary challenge with this IoT becomes the security of the data and the storage for the data. The various hackers all over the globe may misuse this feature and may make the data liable to the reduction in data security assurance. The various sensitive data can be stolen by the hackers via various smart connected devices. The advancing technology is penetrating our lives so deeply that it became an inevitable part of our day to day life, at the same time, there is a pronounced risk of security threats. The various enterprises uses centralized model for the connection of users. In order to monitor the centralized model performance, there are so number IoT’s. This is what makes it an obstacle of this decentralized model. This obstacle is over shading the various advantages of IoT connected devices. As discussed above, data security is one of the biggest challenge in this tech world. Answer to this problem is the integration of Internet of Things and Blockchain technology. 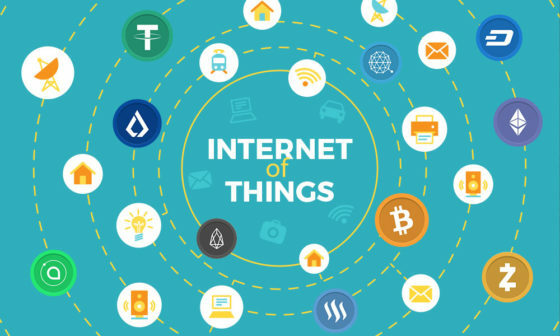 With this integration of IoT and Blockchain technology, one can secure confidentiality of the data, which is the basement for all the various well connected devices and will offer security to the IoT network. The various threats associated with IoT are due to the breakable network security, but with the help of Blockchain technology, an unbreakable network security can be established. Now, let us see how this unbreakable network security can be established Basically, Blockchain technology consists of three element, namely security, encryption and lastly agreement. As a rule, all these three element will run together and will upshot the allied the detailed data and network streamline at every single time. This will help in creating an unbreakable network security. This creation of unbreakable network security is making the Blockchaintechnology, a strong support for all those connections which are IoT enabled. In other words, this amazing Blockchain technology is serving as a promising technology partner for IoT. Integration of Blockchain Technology and IoT will greatly influence the business systems, talking in details, IoT will help in scanning the product which is made by the manufacturer on a collective basis, using smart devices and using the Blockchain technology, helps in tracking that particular product at any point in the supply chain. Integrating these two technologies will help the entrepreneur to process their products with utmost security and helps in tracing the product easily. The integration of these two technologies will help in increasing the efficiency, having better control over the supply chain, reduce the stock wastage, increases the speed. The missing link between the confidentiality and the accuracy concerns on the IoT, can be spotted by the integration of Blockchain technology with the IoT. I am Manisha, a Technical content writer at FuGenX Technologies. FuGenX is a CMMI Level 3 company and is a fastest growing mobile apps development companies Bangalore, Hyderabad, Delhi and Noida, India. Are You A Part of This Google Family?